Which properties help us reuse datasets? Finding both data and software for reuse. Visualising data from two different sets. Please read both datasets’ abstracts now (North Greenland Ice Core Project Members 2007; Lorius et al. 1979). Noticed the DOIs & metadata? Both datasets are Findable. Noticed the Download links over https? Easily accessible. The list of parameters in both cases show that Age and d18O H2O were measured. Looks interoperable. However, will the data also be FAIR on the technical level, where we actually work? Will it be machine-reusable? We’re not going to use Excel for 8k datapoints, right?! The last point makes it clear that we will work in a script file (.R or .Rmd). Challenge: How do we best download the datasets? Download dataset as tab-delimited text manually, save the files, then read them in. Write our own little download function, e.g. with a vector of dataset IDs as input (c(586886, 57629)). There is a third option ;-) Looking for an R package or a Python module related to the data repository. Search CRAN.R-project.org/web/packages/available_packages_by_name.html or ROpenSci.org/packages for “PANGAEA” (Chamberlain et al. 2018). Challenge: Before installing your search result, check whether it seems useful. How would you go about this in case of an R package or Python module? ROpenSci.GitHub.io/pangaear/reference gives an overview of its functions. pg_data() sounds like what we need. ##   ..$ parent_doi: chr "10.1594/PANGAEA.57629"
##   ..$ doi       : chr "10.1594/PANGAEA.57629"
##   ..$ url       : chr "https://doi.org/10.1594/PANGAEA.57629"
##   ..$ path      : chr "/Users/katrinleinweber/Library/Caches/pangaear/10_1594_PANGAEA_57629.txt"
##   ..- attr(*, "class")= chr "pangaea"
##   ..$ parent_doi: chr "10.1594/PANGAEA.586886"
##   ..$ doi       : chr "10.1594/PANGAEA.586886"
##   ..$ url       : chr "https://doi.org/10.1594/PANGAEA.586886"
##   ..$ path      : chr "/Users/katrinleinweber/Library/Caches/pangaear/10_1594_PANGAEA_586886.txt"
Both lists contain some metadata and the actual data as a tbl_df. What is that? Hint: It’s from the tidyverse. In order to answer our research question (see above) we need to be able to combine both the Age and the d18O. To verify that both variables are really labelled in exactly the same way, we extract both tibbles and compare their variable names. ##  "Age [ka BP]"             "d18O H2O [per mil SMOW]"
We get only exactly two variable names. This is great, because if there had been even the slightest difference in the name, unit, or a spelling mistake, we would have seen less output, because the names wouldn’t have intersect-ed. 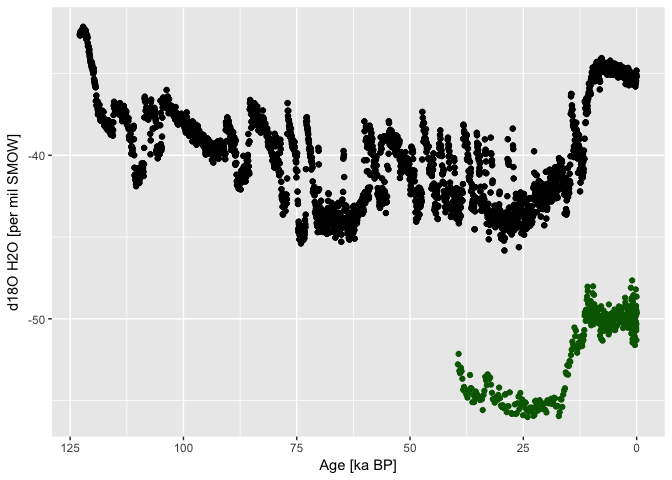 We can now plot both datasets’ d18O H2O values against the same Age axis. Because the variables names contain spaces and brackets, we have to use the “back tick” character (`) around both. Snake_case colum names would have saved us from this, but hey! ## Warning: Removed 16 rows containing missing values (geom_point). Incidentally, the Dome C core (black, east Antarctica) captured higher d18O concentrations, than NGRIP (Greenland). Because of the inverse relationship of d18O to temperature [@EPSTEIN1953213], it seems that the Southern Hemisphere was been cooler than the North. Integrating the two datasets with this little code was possible, because both variables are named exactly the same and thus easily machine-readable. Granted, interoperability encompasses a few qualities besides uniform variable names. However, the datasets were well findable & accessible, and community-standard variable naming and the CC BY 3.0 license meant good reusability. This is the power of FAIR Data combined with usable software: Reducing the burden of finding, downloading, cleaning up datasets, and actually using them. b) specify in geom_point which second y should be plotted. Chamberlain, Scott, Kara Woo, Andrew MacDonald, Naupaka Zimmerman, and Gavin Simpson. 2018. Pangaear: Client for the ’Pangaea’ Database. CRAN.R-project.org/package=pangaear. Epstein, S, and T Mayeda. 1953. “Variation of O18 Content of Waters from Natural Sources.” Geochimica et Cosmochimica Acta 4 (5): 213–24. doi:10.1016/0016-7037(53)90051-9. Lorius, C, Liliane Merlivat, Jean Jouzel, and M Pourchet. 1979. “Isotope climatic record from ice core Dome C.” Data set. PANGAEA. doi:10.1594/PANGAEA.57629. North Greenland Ice Core Project Members. 2007. “50 year means of oxygen isotope data from ice core NGRIP.” Data set. PANGAEA. doi:10.1594/PANGAEA.586886. The FAIR-er a dataset, the easier its reuse in answering a new research question.